Fillets or Sticks? You decide. Either way, these are are a much more delicious and nutritious option than store bought frozen breaded fish! 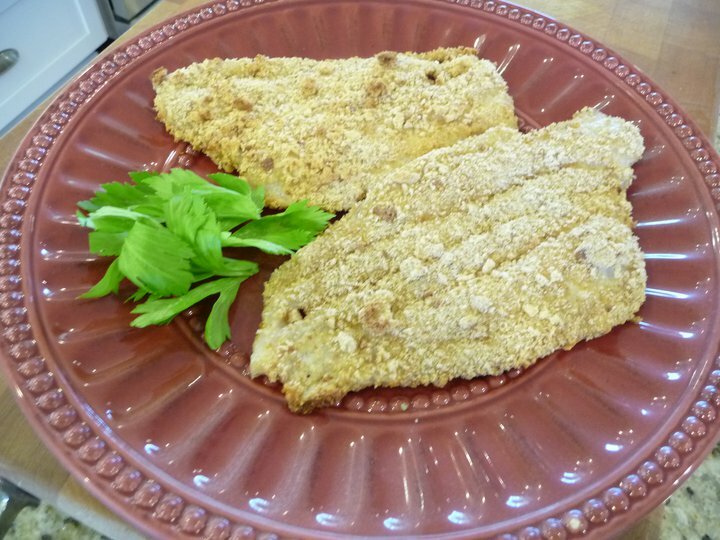 It doesn’t take a lot of time to make your own breaded fish fillets (or sticks) and by doing so you avoid all those unwanted additives found even in “healthy” varieties. This is a great recipe to double-up and freeze for later use! Time-Saving Tip: Make a double batch and freeze. To freeze, simply loosen cooked fish from bottom of the baking sheet, but leave fish on the baking sheet and set aside to cool completely. Then, place baking sheet in freezer for a couple of hours to freeze the fish. Once frozen, place fish fillets (or sticks) into a freezer-safe container and freeze. When ready to eat, simply transfer frozen fish to toaster oven and reheat as directed in the recipe notes below. Preheat oven to 400 degrees. Lightly oil a baking sheet with olive oil and set aside. In a wide shallow bowl or dish, whisk together Kefir, egg whites and seasonings until slightly foamy. 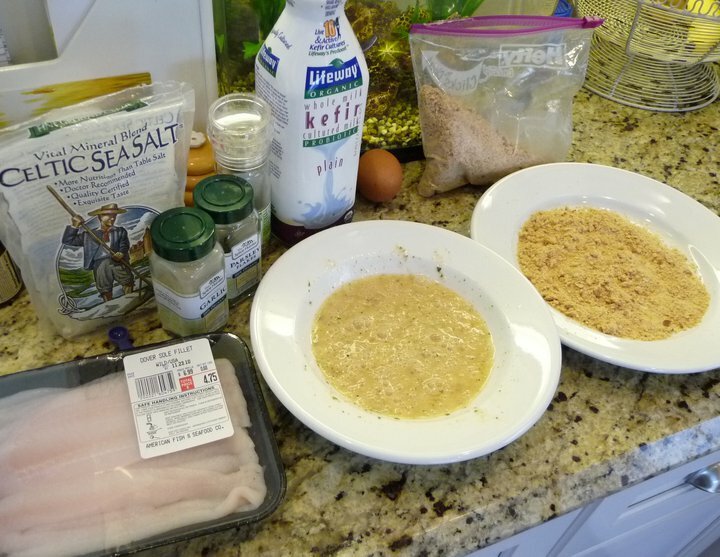 If you'd like to make fish sticks, cut fish into strips about 2-inches wide. Place fish fillets (or sticks) into the egg wash and be sure to turn them to ensure they are well coated with the egg wash. Allow fish to sit in the egg wash 1-2 minutes. On a large plate, add one cup of homemade breadcrumbs. Remove fish from egg wash, one piece at a time, and dredge through the breadcrumbs, making sure to thoroughly coat each side. Place fish on oiled baking sheet, sprinkle with a pinch of salt and bake approximately 12 minutes. Serve with your own homemade tarter sauce by simply mixing together 1/2 cup organic mayo (or greek yogurt) with 1/4 cup organic ketchup, a dash of dried dill weed and a tablespoon of pickle relish. YUM! To Reheat Frozen Cooked Fish Fillets/Sticks: Place frozen precooked fish fillets (or sticks) on baking sheet and bake in preheated oven at 350 degrees for about 10-15 minutes until warmed through. For information about the safest, most eco-friendly fish in your region, download a free pocket guide from the Monterey Bay Aquarium. Made this for dinner tonight and it was a big hit! Everyone loved it, including my almost 3 year old daughter! I substituted a pinch of cayenne for the paprika because I didn’t have any and added seasonings to the breadcrumbs as well as the egg wash. It was delicious!!! Made a double batch and froze half – what a great idea!!! Thank you for sharing your wonderful recipes! Thank you very much for your grain-free recipes. I am new to baking with coconut and almlond flours and it is a relief to find your recipes! Your web site is also a treat to behold. Thank you for sharing this, Kelly! Do you think you could use yogurt (homemade, raw so it’s quite a bit runnier than regular yogurt) instead of the kefir? I’m a little confused about the directions for freezing these. You cook them and then freeze them, and then reheat at 400 for 12 minutes, the same temperature and length for when you cooked them in the first place? You said in the Time-savings tip to “put in the toaster oven and reheat as directed above”, but I didn’t see directions for reheating above, only the directions below, which didn’t mention the reheating directions. Thank you! We’ve made this several times, but I’ve never made a double batch – but with baby number 5 due in 6 more weeks, I’m trying to have some easy go to freezer meals ready! Thanks for fixing the recipe!! My son is allergic to eggs. Any ideas for something I can use besides eggs to get the breading to stick? Thanks!